Oh man what a great day! One of the favorite days on the GDT for both of us. This is going to be a long entry with many photos, so enjoy! As expected, all our gear and tents were pretty wet from condensation in the tall grass. We were in fog as we set off at our new start time of 6:45am. It’s been dark while we’ve been packing up and that just feels wrong, so we pushed the start time back to 6:45am. I’ve been quite tired the last week or so, so I am really liking the later start time. We both like waking up to see the sunrise as we hike and we haven’t gotten much of that this hike. This felt like the first morning that we got one of those early morning sun experiences. 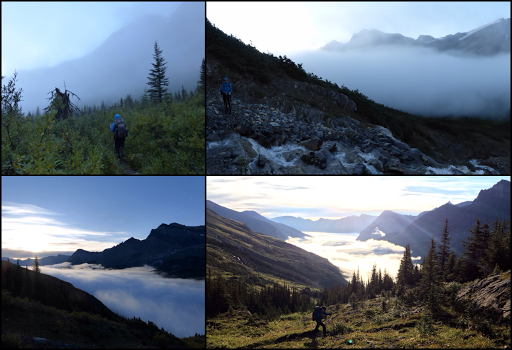 As we hiked up steeply to Bess Shoulder, we hiked above the clouds and got a great view. I love this perspective of being above the clouds, especially the contrast after being down in it and seeing little. Once we got to the top of Bess Shoulder, we decided to take in the moment and E would have her breakfast early rather than down in the dense woods that we were headed into. Then we realized clouds were coming in and this might be our one chance all day to dry things out. We did a complete yard sale of everything that was wet and dried it best we could before the clouds took over for the day. Things weren’t completely dry, but we were glad we took advantage of the sun while we had it in case it didn’t return. 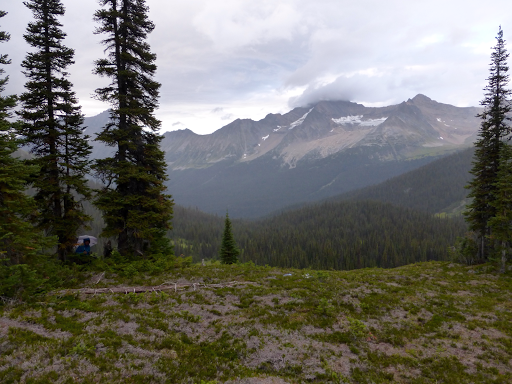 From Bess Shoulder, we dropped into the forest to fairly good trail that wasn’t too overgrown and had less blowdowns. There were a couple washed out avalanche sections, but they were fairly easy to get through the debris. We totally expected worse trail and slower travel through this stretch, but it seems that some trail maintenance must have been done, possibly by horse packers, in the last year or two. Whoever is maintaining this section, we are thankful! Next up was a major decision we’ve been contemplating for awhile now. 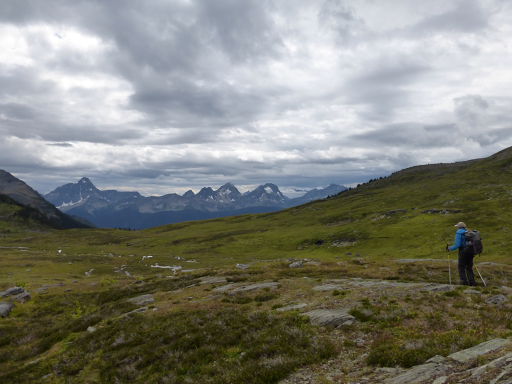 There are a few alternates in this final week that choose a more time consuming and challenging high alpine route over the low route through a lot of bogs, meadows, and overgrown forest. 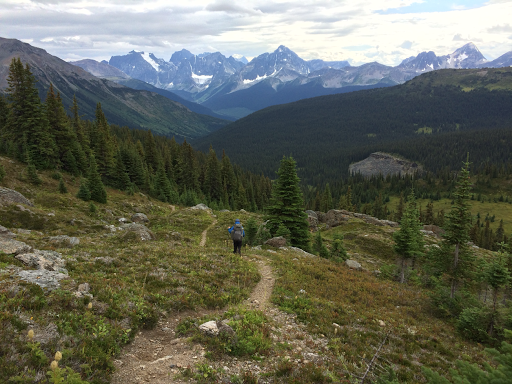 Many would think it’s a no brainer to choose the high routes, but there are few hikers that have done them and less beta on the routes that are mainly cross country. There are many reasons why they haven’t been done. 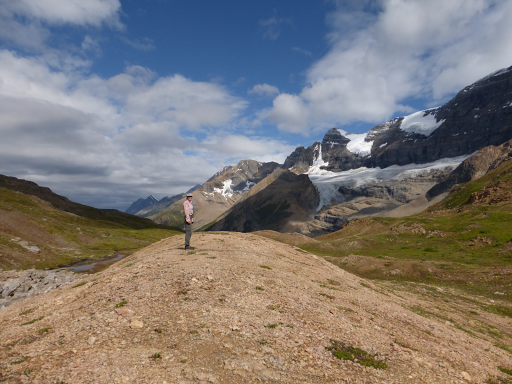 First off, many GDTers choose to end at Mt Robson and not hike the final nine days or more to the remote Kakwa Lake. Secondly, this final leg is challenging enough and adding the high routes may be more rewarding, but they take more time and energy that many cannot spare in an already nine day leg. Fourth, the weather has to be optimal to pull these high routes off and this area really draws in the whole spectrum of rain to snow. 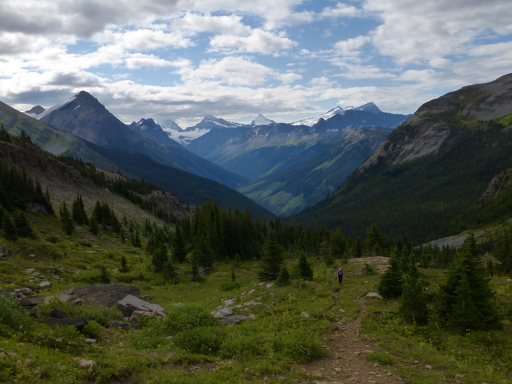 The choice we had today was the big daddy of them all, the Jackpine High Route. In our original planning, we dismissed it due to timing and intimidation as it is a challenging route. 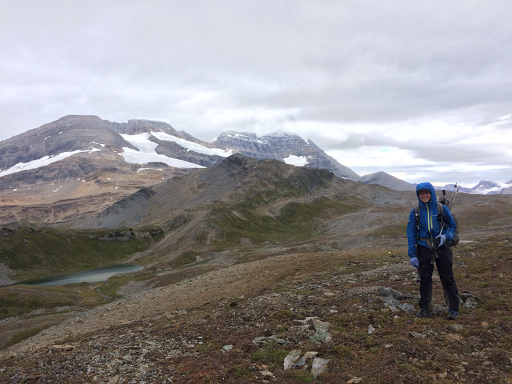 Back in Banff, we asked the GDT guidebook author, Dustin Lynx about how challenging it was compared to some of the other challenging and rewarding alts we’ve done this hike, like Barnaby Ridge and Coral Pass. Dustin said it was within our comfort level and ability if we were comfortable with the others and we’ve been contemplating Jackpine High Route ever since. 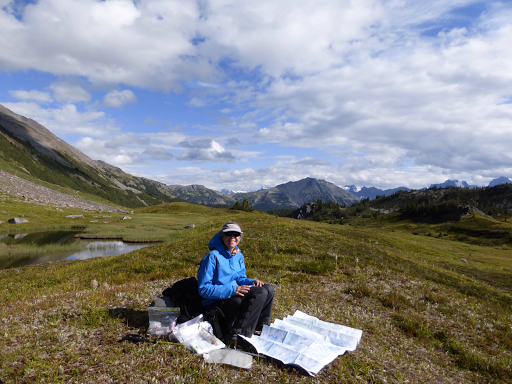 Since it is more technical, intimidating, and less traveled, we bought extra detailed maps while we were in Jasper. Also, this whole trip, we’ve had the benefit of using Ben Mayberry’s personally made GDT resource packet that includes, among many things, notes on tricky sections from previous hikers. The beta on the Jackpine High Route was that it was very rewarding, and far superior scenically to the low route, but quite challenging and the route could contain quite harrowing parts of exposure and scrambling. For us, we weren’t sure that we’d be comfortable on some of the more harrowing parts, but we saw that there was a way to do the tamer first part of the alternate and then take a bailout down to the low route. Clouds were moving in, but they looked to just be scattered showers and nothing terrible, so we decided to go for it. 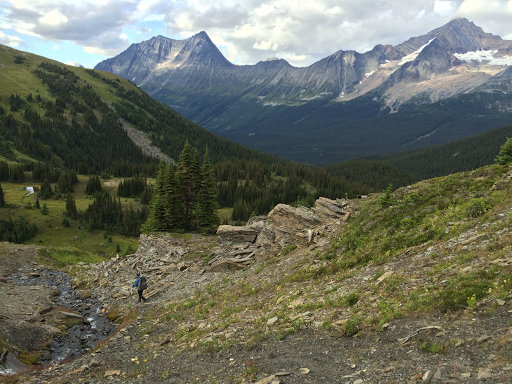 We had calculated that we had about a day of bonus hiking time on this leg than originally planned because a couple, Pete and Carol, volunteered to drive in an get us at the remote trailhead where we finish at Kakwa Lake. If we didn’t have that ride, we’d be walking an additional 45mi/73km on the dirt road leaving from the trailhead to get to a major highway and hitch. Now that Pete and Carol are picking us up, we have some time to try out some alternates. So, with all this in mind, we decided to at least try the first part of the Jackpine High Route to gauge our comfort and timing for possibly doing the rest. Before the official trail (low route) drops down into brush, it goes over Jackpine Pass just .5mi after the high route intersection. 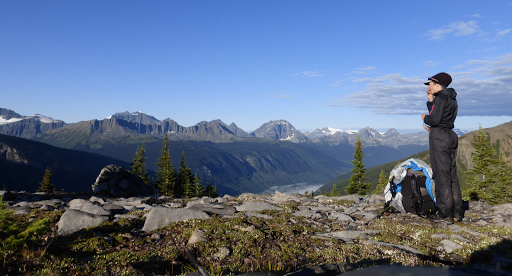 We didn’t want to miss that view from the pass, so we dropped our packs and went up trail to check it out. Totally worth it and fun to run up without a pack on. Once back, and going up the alternate, it wasn’t long before we were up on top of the world and we knew we’d made the right choice. We had a brief guidebook description and a track from a previous hiker that was one of many options, but there were also fairly followable horse paths. We followed the horse path in and out (E is great with this tracking!) and weren’t quite sure which would be most efficient. 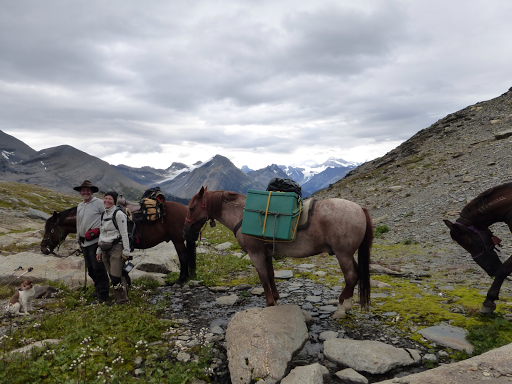 Then we saw the most unbelievable sight…it the distance, coming towards us were horse packers! 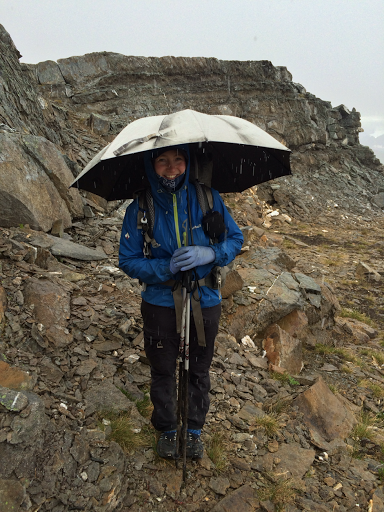 We didn’t expect to see anyone this leg much less up on the high route in less than ideal weather. It turned out to be Gunter and Sonja, a couple from Germany and Austria, who have been horse packing for years, have written many books (in German) and been out here many times. This time they are out for a month. 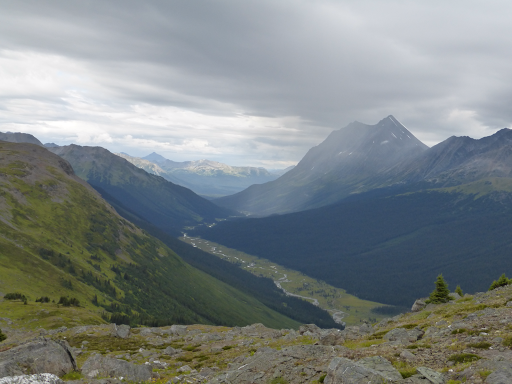 Over many years, they’ve horse packed the Divide from Mexico to Alaska. They support the horse packing by giving presentations in Europe along with the books they’ve written. Their website is www.abenteuerreiter.de Just getting to meet them made doing this alternate worth it! They had a blissed out peace and contentment that made meeting them feel like a dream. To me, it was totally like that moment in the movie, Field of Dreams, where the ball players emerge from the corn and one asks if they are in heaven. They were able to give us some info on where we were headed and had just come most of the way we were going, so we had fresh tracks to help guide the way. Really wonderful to meet them. 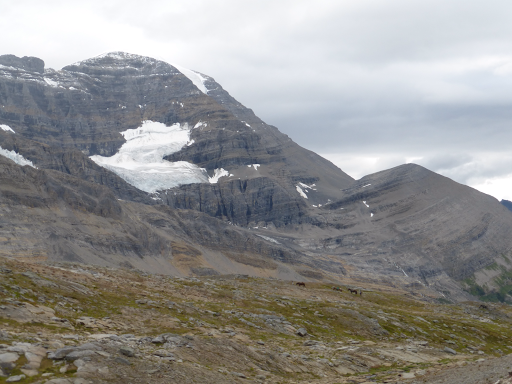 Here they are in the distance as they hiked away. 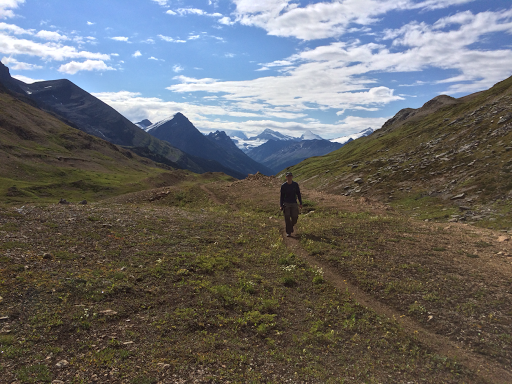 This was turning into a day of non hiking with our morning drying, side trip to see Jackpine Pass, and meeting Gunter and Sonja, but we didn’t mind. This was a bonus day in our minds and we wanted to soak it in. 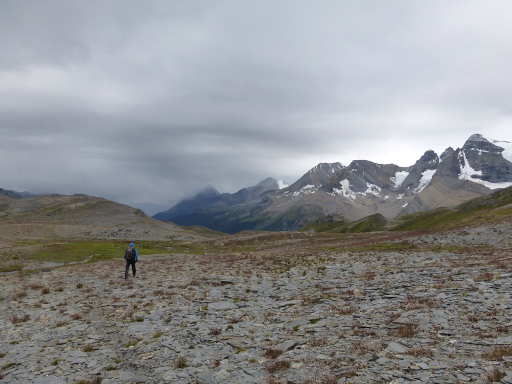 As we continued up on the Divide, there was light precipitation on and off in the full spectrum from rain to snow, but we were too happy up there to care. When there seemed to be a good window between weather and we saw a good shelf to shield ourselves, we took lunch with a great view. It snowed some on and off and still, we loved it. At one point, we could see down to the boggy valley we would have been in. Beautiful to see it from above knowing we were missing some not-so-fun hiking. Notice the rain shower passing over it too. We continued on to a tricky section that might have had a steep down scramble, but there was an untested suggestion to try a lower bench approach and E’s intuition led us in the right place. We looked back on the scramble we avoided and were very happy the suggestion worked. 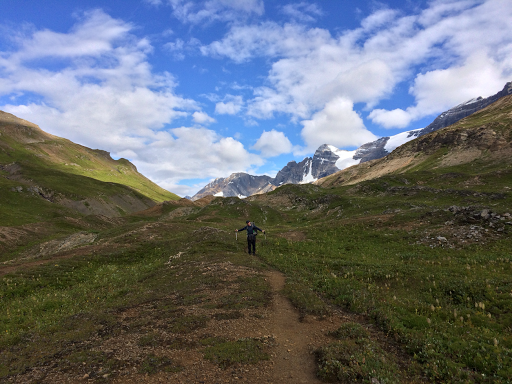 From there, we headed down to more of an alpine stretch with an actual trail appearing for the descent…and the sun came out. It was great! At the end of the day, we came to the intersection to nail down to the official low route and weighed our options. E called it the “summit among summits” ha! I was able to message my sister through my InReach device and found out weather was mostly clear. The more we looked at the description, there were many unknowns and we weren’t sure if we a) had enough time, and b) if some of the sketchy stuff was in our comfort zone. In the end, we decided that we needed at least one more day to be able to give the rest of the alternate a try and we headed down the first bailout at the Jackpine Mtn trail. It was the right thing to and we both are happy that we took today to do this first part. We hiked down the Jackpine Mtn trail just enough to be sheltered and stop before we dropped completely into the trees. It was 6:45pm and was a great spot. We had a view of the range across the way and Jackpine Mtn behind us. We set up as clouds moved in again and it rained on and off through dinner unfortunately. Good thing is that E found a sheltered dry spot in the trees we used. Look to the left side to see her under the umbrella. It’s pretty darn cold right now and everything outside is nice wet from the rain for tomorrow morning. I guess it will be another morning of diving into cold wet brush in the rain gear. I’m just glad we got out of it for today and were able to experience a bit of the high route. What a great day! Meeting you on the trail, has been a pleasure to us, too! I’ve often been thinking of you, wondering how your trip went. Unfortunatly I had lost your Card somewhere in my pack – but happily I just found it – almost a year later! I now we are reading through your Blog with exitement – thank you for sharing! Ah! Sonja! 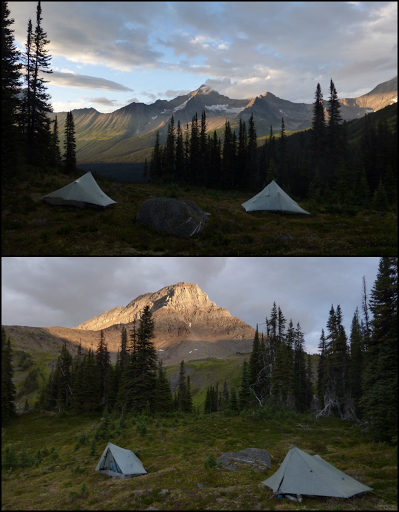 I almost headed further north in Canada this summer and worried I’d need pack rafting skills and tabled it for now. I still plan on contacting you two if/when I want to go further.